2019 notification is for the available 37 Posts all over India. FSSAI Central Food Safety Officer Jobs Recruitment 2019 is through Computer based test and written exam. FSSAI CFSO vacancies online applications are accepted from 26-03-2019 to 25-04-2019. Official website for online form for this this FSSAI CFSO Notification is www.fssai.gov.in. 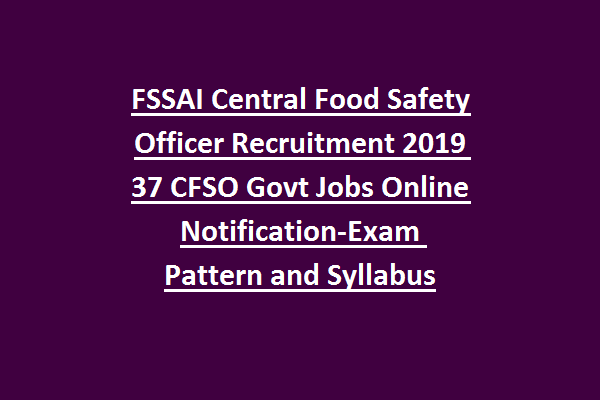 FSSAI Central Food Safety Officer Recruitment 2019 Exam Pattern, CFSO Exam Syllabus, CFSO Online Application Form, CFSO CBT Exam date, CFSO Written Exam date, CFSO hall ticket/admit card release date, eligibility criteria and other information this FSSAI Central Food Safety Officer Recruitment Exam 2019. 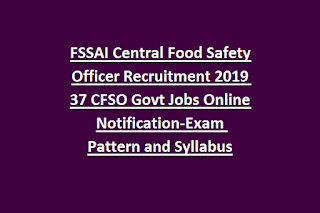 There are total 37 Central Food Safety Officer vacancies in this FSSAI Recruitment 2019 Notification. Food Technology or Agricultural Science or Dairy Technology or Biotechnology or Masters Degree in Chemistry or Veterinary Sciences or Bio-Chemistry or Oil Technology or Microbiology or degree in medicine qualified candidates are eligible to apply online for this FSSAI Notification. Age limits are 18-30 years for this FSSAI Central Food Safety Officer Notification 2019. For Sc/ST candidates 5 years and OBC 3 years, PWD 10 years of upper age relaxation will be given. Age limits cut off date is 01-07-2019. Level 7 pay scale is applicable for FSSAI CFSO Vacancy. For FSSAI CFSO posts written exam will be held in 2 stages. Computer based online exam will be conducted for 400 marks. Total 100 questions will be given from 2 sections. For each correct answer 4 marks will be awarded and for each wrong answer 1 marks will be deducted. Apply online for this FSSAI CFSO jobs through official website of www.fssai.gov.in. Closing date of online form is 25-04-2019. FSSAI CFSO posts Exam Pattern, CFSO Jobs Syllabus, Central Food Safety Officer CBT Admit Card/Hall ticket available date, CFSO CBT exam date for these FSSAI CFSO Posts vacancies will be updated in this website only.